John O’Sullivan says the FAI’s figures for 2015 need to be broken down to be understood. A full house at Markets Field during Limerick's promotion/relegation play-off. THE SSE AIRTRICITY League added 2,500 ‘bums on seats’ each month across the 2015 season. That’s a fact that the FAI revealed yesterday and it’s worth celebrating. Every time attendances increase, every time new fans come in through the gates, we should be positive. We should also examine how increases are achieved, using that information to drive further growth. Importantly, we also have to acknowledge and understand where we fall down. The FAI got the first part right yesterday, positivity about the increase. However, the news was presented in a way that left lots of questions. It felt like spin rather than straightforward good news. The FAI would rightly argue that pushing the positives is their job. Hopefully they’re looking for trends within the figures to help clubs and further grow attendances. We can break down yesterday’s news ourselves, but with some difficulty. We saw a lot of percentages but only one meaningful figure. There were “almost 375,000” individual visits to League of Ireland grounds last season, which was a 6.8% increase on 2014. This is an actual increase of 24,000. This looks great, but we need to dig deeper and look at the context – where did the increase come from? In a nutshell, most was due to a new club joining the league and a new stadium opening in Limerick. As usual, clubs that had something to play for at the end of the season were the ones reporting increases and that again will mask drops in attendances at other clubs. As an example, Cork City publishes official attendances for all games so we know they lost 12,000 off attendances compared to 2014. However, this season they had one home League game fewer. Much of the remaining downturn coincided with their title challenge fading. The largest positive contributor was the addition of Cabinteely FC at the start of 2015. Simply put, it gave us 28 ‘new’ fixtures which created a market and interest that the Shamrock Rovers B team did not in 2014. Based on official club figures and estimates from extratime.ie, Cabinteely attendances at Stradbrook across 2015 totalled 8,500 with a further 5,500 at other grounds for Cabinteely’s visits. 14,000 of the 24,000 are largely attributable to the addition of a new club. Now that’s not necessarily a negative. The seven-team First Division was unsustainable. Cabinteely have added a lot to the league and maintained solid attendances throughout the season, even after the novelty of their first few games wore off. While we can’t just keep adding new clubs to the league, the Cabinteely addition has been a positive. The biggest winners in the Premier Division were Limerick FC, with a 48% increase over 2014. Rooted to the bottom of the league at Jackman Park, they averaged 580 over the first seven games of the season, which was lower than their 2014 average. The Markets Field opened, fortunes on the field improved and the average jumped to 1,644, with a further 4,600 jammed into the ground for their play-off game with Finn Harps. It’s hard to estimate what increase is due to the Markets Field and what is due to their late resurgence, but Limerick added 6,000 to the cumulative league attendance this season. In a nutshell, 83% of the increase can largely be attributed to a new club and a new stadium. Which is fine, but it doesn’t help forward planning much as these are such unusual events. It’s not a surprise that Finn Harps’ and Wexford Youths’ promotion push saw an increase in attendance, though the recorded increases of 77% and 62% respectively are staggering. It’s great that Youths and Harps have unearthed a latent support that they can build on as they move into the Premier Division. Galway and Longford did in 2015, both recording increases from their First Division figures a year earlier. Youth’s highest official attendance in 2014 was 363 and in 2015 their promotion push made all the difference. They averaged 345 per game over the first seven games of the season – no different to 2014 – however they averaged 623 over the next five before 1,321 turned up on the night they clinched promotion. Over one quarter of their cumulative attendance came in their final two games. The 5,213 attendance at Finn Harps’ two home play-off games does not seem to have been factored into the figures. 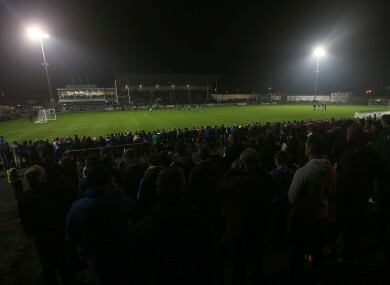 The 2014 cumulative attendance in Finn Park was approximately 5,400. It really was a bumper year for Harps as regular season attendance rose by almost 5,000 in 2015. These figures do mask issues at other clubs, particularly in the First Division. If you look at the figures for Cabinteely, Finn Harps and Wexford Youths, acknowledge that Cobh Ramblers also increased attendances; you would expect a higher overall rise. It must be a source of worry for the remaining clubs in the First Division who demonstrably had lower support. Looking at the figures, the largest increases and biggest individual attendances happened when clubs had something to play for. In Limerick, Galway and Longford’s cases, the enthralling relegation contest kept their fans coming back. This strongly supports looking at a change in structure in how the league might run. Not in terms of numbers of teams per division, but in terms of play-offs and maintaining a situation where clubs have something to play for as long as possible. Owen Cowzer had a wonderful piece on the NASL in The Sun this week which highlighted how their play-off system was helping to increase attendances for all clubs. It might be worth looking at again. Email “The rising tide in League of Ireland attendances isn't keeping all boats afloat ”. Feedback on “The rising tide in League of Ireland attendances isn't keeping all boats afloat ”.